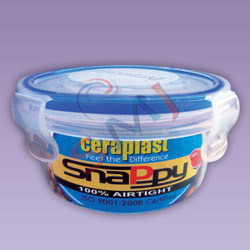 We are manufacturer of Airtight Container - 250ml. SMJ Venture Private Limited (formerly Advance Rubtech Pvt Ltd), is a well known name in the manufacturing and supplying of battery vent caps and battery spare parts like press fit handles, rope handles, straight pole caps, L- type pole caps, fume arresters and many more. These vent caps and accessories are used in all sorts of batteries such as automotive, inverter, traction, solar, industrial, train signal and lighting. From a humble beginning in 1994 to where we are today - it has been an arduous and satisfying journey. Manual processes to fully automated production and assembly lines, a 1000 SQFT shed to 35000+ SQFT shed, a 90 SQFT tool room to a machine shop spread over 3300+ SQFT, an ad-hoc product development approach to a research based approach with an in-house R&D division equipped with 3D CAD, a team of 10 to a team of 150+, a single product to dozens of products, industrial products to industrial service and FMCG products - that's no mean achievement and we are really proud of it. Our diversification into the FMCG space (with introduction of plastic containers under "Ceraplast" and camphor tablets under "Deep" brand) and in the service sector (with introduction of laser welding service) is an outcome of a robust strategy to pursue multiple drivers of growth. This type of diversification is often seen with scepticism but we see these new lines of businesses to fuel our growth engine in near future, post the encouraging response to our test marketing of our new offerings. Innovation has been a constant companion of SMJ since the very beginning. From ordinary caps to ceramic caps to porous caps and continuing, we have kept pace with times in terms of quality, design and technology. The quest for newer and better products has led us to develop vent caps for OPzS batteries, Anti Splash "Provent Caps" and L- Type Pole Caps. Our Design and R&D team is working on some very exciting projects and concepts and we are very confident about the business prospects of the same. Our products have found favor not only with Indian buyers; they have been equally appreciated by overseas buyers as well. Our products have led us to markets such as Bangladesh, Kingdom of Saudi Arabia, Argentina, Chile, Ukraine, Oman etc. We would like to keep the tradition going and do everything possible to reach many more frontiers. In order to grow and prosper in today's competitive world, a company must keep its back office efficient and nimble to serve its customer better. Adoption of a scalable ERP solution namely Libra is a step in that direction. We are working on some path breaking concepts and implementations, so far unheard of in small enterprises. It is often said, "in order to be good, stay in company of good people" and SMJ has been fortunate to be with good people - Customers, Vendors, Bankers and last but not the least it's Team Members and we are thankful to each one of them. Together we'll write a great success story.